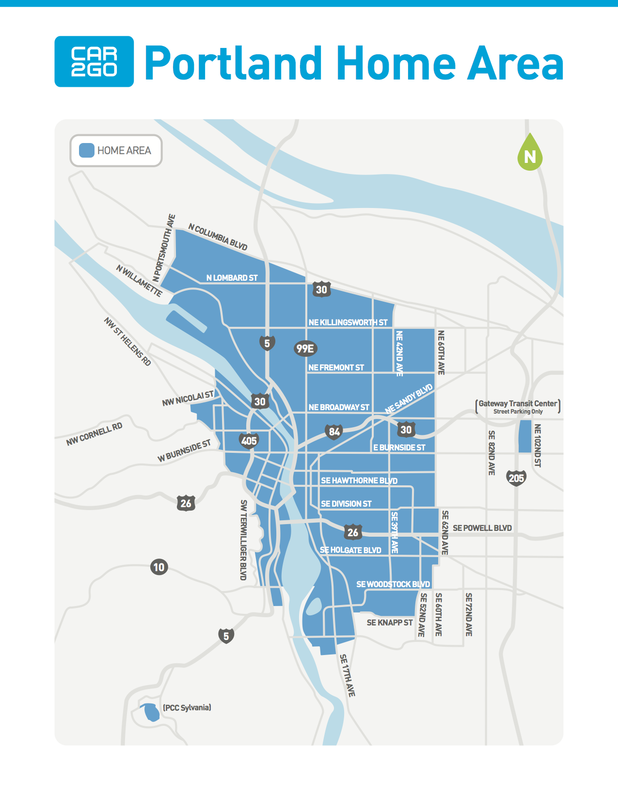 As a relatively new resident of Portland, Oregon who doesn’t own a car, I’ve become quite reliant on walking, public transit, and a nifty service called Car2Go (plus the occasional Uber or Lyft). Car2Go is a pretty neat on-the-spot car rental service that I first joined while visiting San Diego a few years ago. Basically, there are a bunch of 2-seater Smart Cars all around a city, and anyone with a membership can walk up to one and rent it for $0.41/minute. You can park it anywhere on the street in that city’s “home area” when you’re done, and if there’s a meter, you don’t have to feed it. There’s a one-time $35 signup fee and a free smartphone app that shows you where cars are in real time. It’s a pretty awesome deal. The branch of Car2Go in Portland announced today that it was “updating” its home area—that’s the area where you can find cars to rent and end your rental—so I went to take a look. Here’s the present Home Area. And here is the new Home area, effective August 24, 2015. I was initially annoyed, because this interfered with my brilliant plan to take Car2Go to within a couple blocks of symphony rehearsals in East Portland this fall. But then I thought a bit more, after realizing that my home and most places I frequent are still well within the new Home Area. I wondered who will actually be most affected by this change. 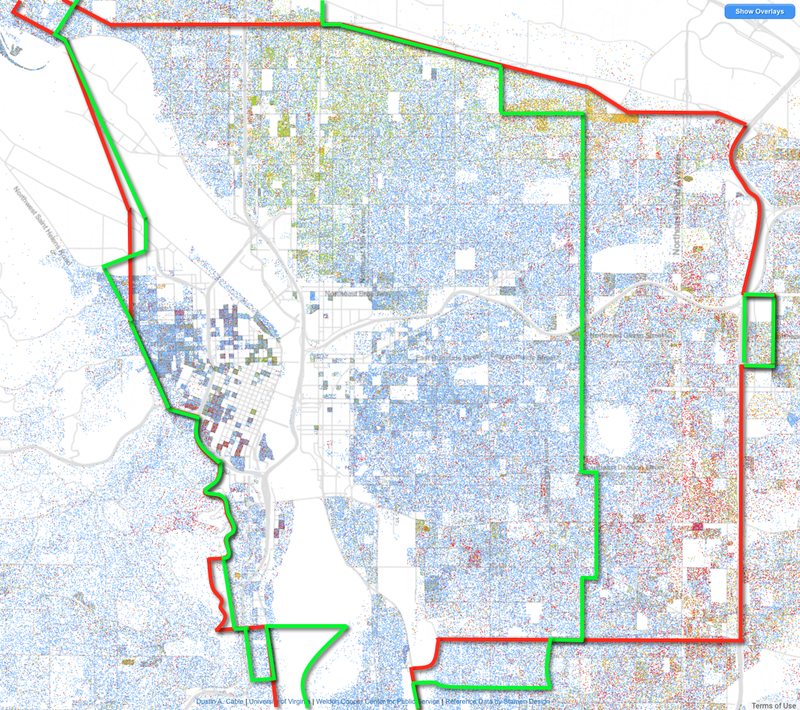 So I pulled up the trusty Racial Dot Map and sketched the old (red) and new (green) Car2Go borders on top of it. I learned three things during this exercise. 1) Manually drawing a bunch of lines on a screenshot is probably not the most efficient way to compare map data, 2) The old Car2Go map is much better drawn to scale than the new one, and 3) Asians, Hispanics, and Blacks will disproportionately be excluded from Car2Go beginning August 24. I took a quick look at a map of Portland income and earnings too, and was unsurprised to see that the areas cut appear to be overall poorer than the areas retained. And for reference, here is a cool map of the “Transit Oriented Development” score throughout Portland. (Note this map is significantly more zoomed-out than all the others here. Source here.) The areas excluded are much less well-served by public transit than the areas retained. Intentionally or not, Car2Go has chosen to offer the convenience of renting a car on the spot predominantly to white, wealthy people who already live near public transit. Based on careful evaluation of member feedback and historical data, we have determined that members are not able to experience the true benefits of car2go as the Home Area size results in vehicles sitting in areas, where they are idle four times as long as our vehicles in high demand areas. By updating the Home Area, we are confident that members will be now able to find a vehicle in the areas that they frequent most. Of course, Car2Go can do whatever they want. But I wish they had dug a little deeper into their ridership data. I would love to see them market their service specifically to areas underserved by public transit and to individuals and families who might not otherwise have the privilege of a private vehicle. With an effort like that, Car2Go could make a real difference in the cities they serve rather than just giving lazy, wealthy white folks (like me) an excuse not to take the bus. Don’t just mope – do something. Capture The Fleet! From now until Aug 24th when they change service area – grab a Car2Go somewhere and bring it into area that’s going to be cut. At end of your trip, make sure you or someone else picks it up in short order and takes it somewhere else – but KEEP the car inside this area. Let’s see how much of their fleet we can capture, and if we can account for more than 8% of their trips for a couple of weeks. One way or another, we’ll be sending them a message. What would that achieve? It’s manipulative but not curative. Normally I’d be right there with you on an issue of racial or economic inequality; however I have several issues with this post. First, Car2go is making a simple, data-informed business decision, which will result in a higher utilization of their vehicles and a better customer experience, which I’m sure helps their member retention rates. We should give them kudos for originally setting the home area to a broader demographic, but why do we fault them if it didn’t work? They’ve been around for over 3 years – are you sure they haven’t tried to make the east Portland area work? Also, focusing on the economic inequality issue, perhaps it’s a position of economic privilege that drives your perspective. 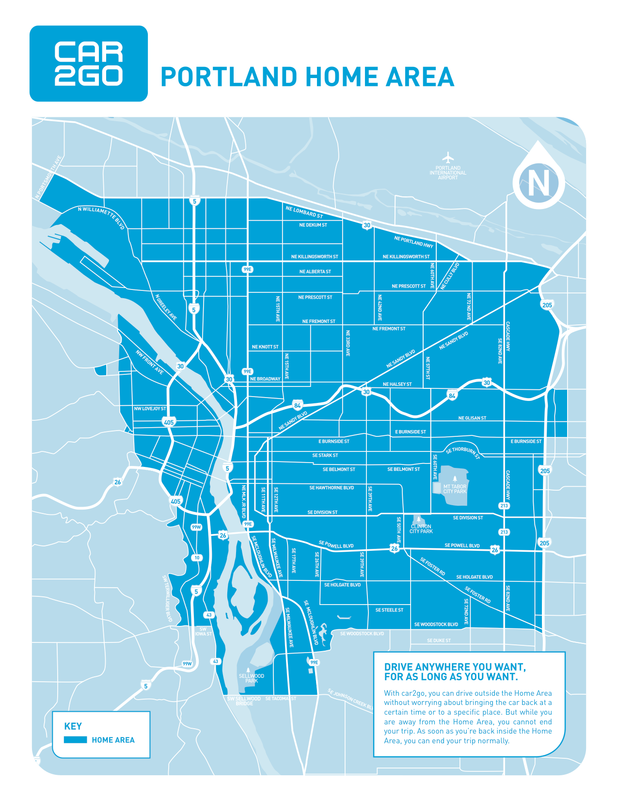 It seems like density aside, lower income areas don’t work well with Car2go, because while it’s still a decent deal for some, paying $12 for a round-trip errand 15 minutes away is still pretty expensive, especially if you’re planning to do this often enough that it’s worth paying the $35 membership fee – not to mention that the whole thing requires a smartphone to use. I appreciate the thought, but your argument comes off a little “let them eat cake” like this time. I agree with Josh – even though I’m one of the people beating the drum to send Car2Go a message on this. That last option, the one they chose for now was easy, low cost for now. But unimaginative, won’t help grow their business, and has annoyed a lot of people who did rely on the service and are upset about losing it. 1) Offer a lower per-minute rate for ANY vehicle that’s been sitting for more than a certain time. These cars could be highlighted in the app when you went looking for a vehicle. 2) Offer an additional discount (or add free minutes to a members account) for any trip that starts in a low-usage area and ends in a high-usage area. C2G would basically be paying the customer for returning the cars to the high service area – but not have to pay their own dispatch drivers to go get them. Did this work on San Diego? Might it work in Portland? Emailing Portland @ car2.com to get their thoughts.